The quality control of Niobium material used for cavity production profits from the operation of a metallurgy laboratory at DESY. Long time expertise is used to study defects found during eddy current scanning. The control of essential niobium properties is of utmost importance for reaching high accelerating gradients and low cryogenic losses. 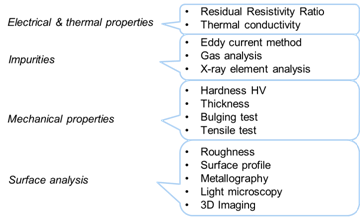 Typical material properties are investigated using the respective tools and methods. The procurement of large amounts of niobium sheets requires QC at both sides (producer and vendor).